A polished plain .925 sterling silver cut-out cross pendant with a Holy Spirit dove symbol at the center, as promise of eternal life for the Christian believer. The cross measures 1" tall x 3/4" wide (1 1/4" tall with the hoop). Add a matching sterling silver box chain to make it a dove cross necklace. When a Christian is born again and saved, he or she receives the gift of the Holy Spirit as a deposit towards eternal life. "In whom ye also trusted, after that ye heard the word of truth, the gospel of your salvation: in whom also after that ye believed, ye were sealed with that holy Spirit of promise," (Ephesians 1:13). 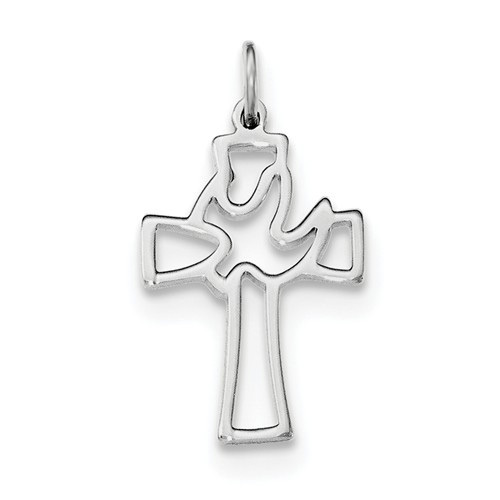 We guarantee our Holy Spirit of Promise Dove Cross Pendant to be high quality, authentic jewelry, as described above.